T.O.F.C. Railroad term which means Trailer On Flat Car. Tariff Rate The rate or price schedule for transporting different items to various countries. Tariff A document issued by a carrier setting forth applicable rules, rates, and charges for the movement of goods. It sets up a contract of carriage between the shipper, consignee, and carrier. 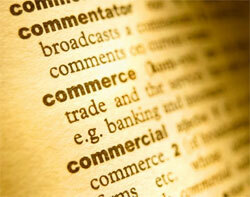 In international trade applications, the term also refers to a tax on imports. Telex A communication wire service that automatically transmits data that has been entered on a teletypewriter. TEU Twenty-foot equivalent unit. Used to measure a vessel's capacity. Third Party Billing The designated payor of an invoice other than the shipper or the consignee. Transmittal Letter The Transmittal Letter, commonly prepared with a Bank Draft, is the document used to send shipping documents to a remitting bank for processing either a collection or payment/negotiation under a Letter of Credit. It contains the shipper's precise and complete instructions on how the documents are to be handled and the payments remitted. Transshipment Shipment of merchandise to the point of destination in another country on more than one vessel or vehicle. The liability may pass from one carrier to the next, or it may be covered by "through bills of lading" issued by the first carriers. 20 Footer A container which is 20 feet in length.